This past week I finally got my hands on a copy of Avengers vs. X-Men: Babies and let me tell you … it was worth it! The story had me laughing from page one (which doesn’t usually have anything but credits on it). It didn’t take long for my seven-year old son to get it from me and after he fell asleep in his bed reading it, I realized I needed to get a new copy, because he is never going to give it back. The story has nothing to do with the events of the AVX series and it’s a refreshing read to all the serious fighting that’s been happening in the Marvel universe. This is a story you buy to read because you need a break from serious. If you don’t want to laugh, avoid it like the plague. 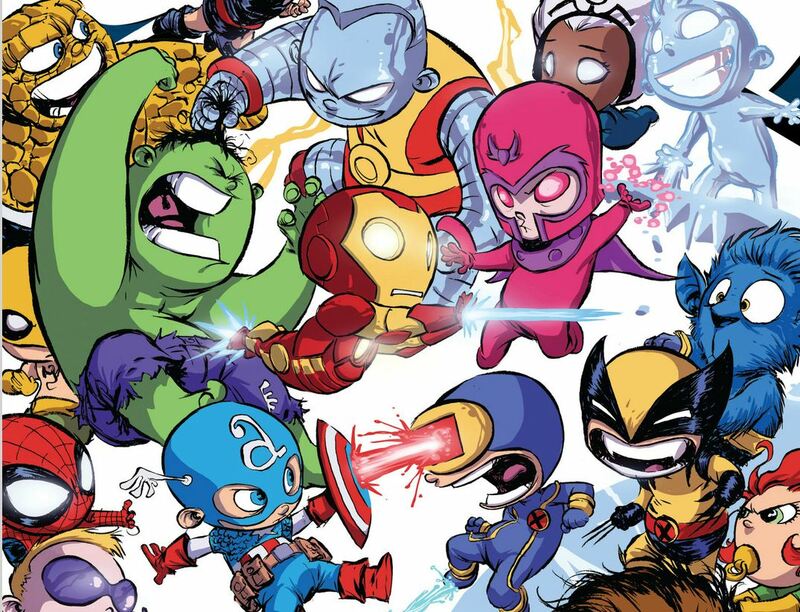 If you want to see baby versions of Wolverine, Captain America, Hulk and many others kick each other in the diaper rash, then pick it up. I’m thinking of buying another copy to frame some of the artwork. The two page battle scene spread would look great framed up in my office. I love how the artists portrayed some of the most popular characters on both teams. I can’t pick a favorite in this fight, because I think they all look great in their baby forms. You can purchase Avengers vs. X-Men from your local comic book store and Comixology. The graphic novel is on sale now on Amazon now. In Willow – Wonderland #1 , the powerful witch now lives in a world devoid of magic, and she sets off on a quest to bring it back. Not only is magic an integral part of her, but of life as wel; she notices that dreams and inspiration have been fading, so she is determined to do whatever it takes to return magic to her world. Willow #1 , written by Jeff Parker with art by Brian Ching, sends Willow to an unfamiliar place where she must use her wits and spells to survive. Although the art in the issue is fantastic, Willow is barely recognizable with only a small likeness to actress Alyson Hannigan, but I quickly adapted and accepted that it is the same old Willow that Buffy fans know and love. 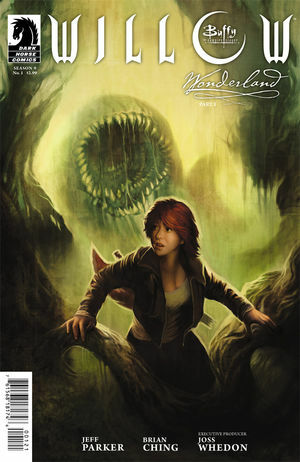 Willow – Wonderland #1 is a solid start to the five issue series, and I’m curious to see Willow continue to take the lead in her own story for a change. One of the titles I was most excited about with the new 52 DC reboot was Demon Knights by British writer Paul Cornell, who wrote the terrific Captain Britain and MI13 for Marvel. 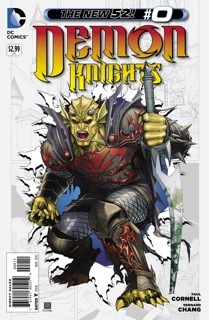 Like that title, Demon Knights also has a Camelot flavor. Two of its members, the Demon Etrigan and Madame Xanadu have magical roots in Arthurian myth. The title is set in the DC Universe’s medieval period and also features the Shining Knight, immortal and villainous Vandal Savage, and three new characters: the Horsewoman, a talented archer and fighter on horseback, Al Jabr, a Middle Eastern fighter and tactician, and Exoristos, a lost Amazon. The first story arc dragged a bit with the unlikely group trapped inside a medieval village under siege. I was about to give up hope the title would kick into full gear and then I received my comic shipment of issues #7-13 and was so glad I’d left Demon Knights on my pull list. The group fractures under pressure, defends two princesses who want to marry, and everyone gets sent to hell to be tempted by a version of the devil. The focus is squarely on the Demon Etrigan and his human host, Jason Blood. It’s never quite clear what Etrigan’s intentions are, save he craves power, and it’s never clear how well Blood controls him and, well, it’s not even clear how Madame Xanadu, who is in a romantic relationship with both selves, feels about them. All of which sounds existential and it is on one level but on the other level, Bernard Chang change has plenty of work to do depicting hell and the various temptations and does so brilliantly. The Shining Knight particularly fascinates me as it explores the question of gender and identity. But, yes, stuff blows up and there’s an attack by pirates riding on the back of a sea serpent. It’s too bad Cornell is leaving the book soon.